A few weeks ago I ordered the ASOS Curve Mesh Insert Knitted Dress, and I had been considering how I wanted to style it to wear out. I kept looking at my accessories, and just not feeling that anything went with it the way I wanted. I decided to use some old accessories of mine that don’t get used often and some accessories from my mother’s collection to inspire these looks. I kept the same dress with the same tights for each look, but I changed my accessories, hair, and make-up to create three distinctive yet simple options. I also only paired the dress with two accessories for each different look. 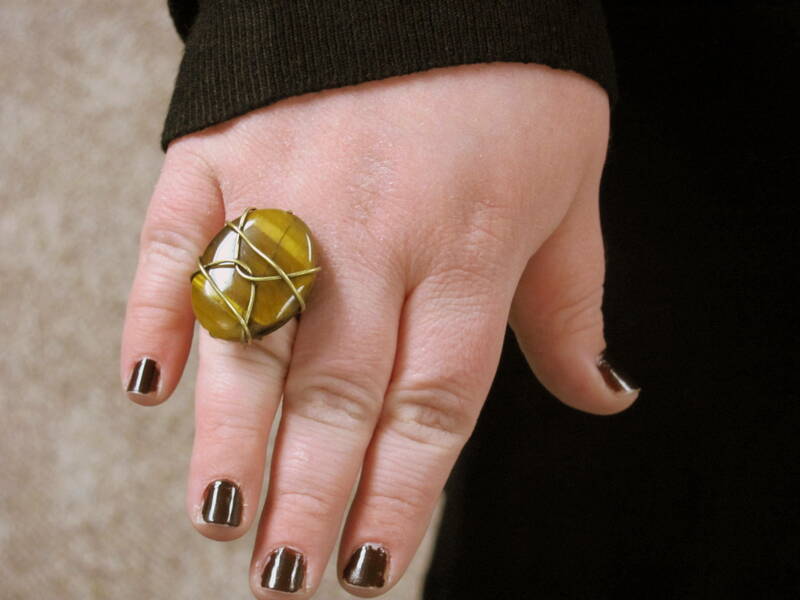 Blogging has definitely pointed out to me that I have not invested money into my accessories. 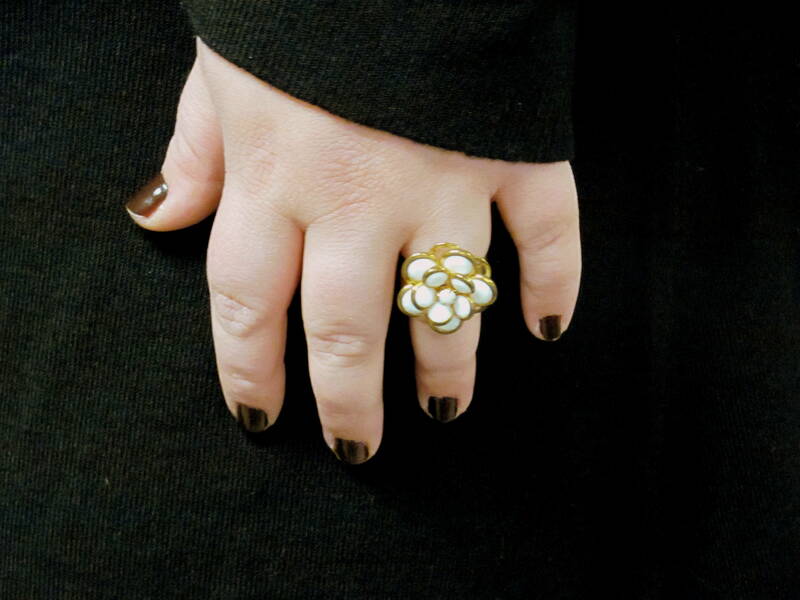 I have mostly gold jewelry, long necklaces, and big cocktail rings. Over the next year, I hope to add to my accessories so that I can change my looks more often. The first look is pearl inspired. I got this great weaving pearl headband from ASOS (no longer on site), and put it together with my mother’s pearl bracelet. I also attempted to create an up-do, although my hair is about an inch or two too short to really achieve anything great! And I wanted to go with a pink lip to play off the romantic pearls. 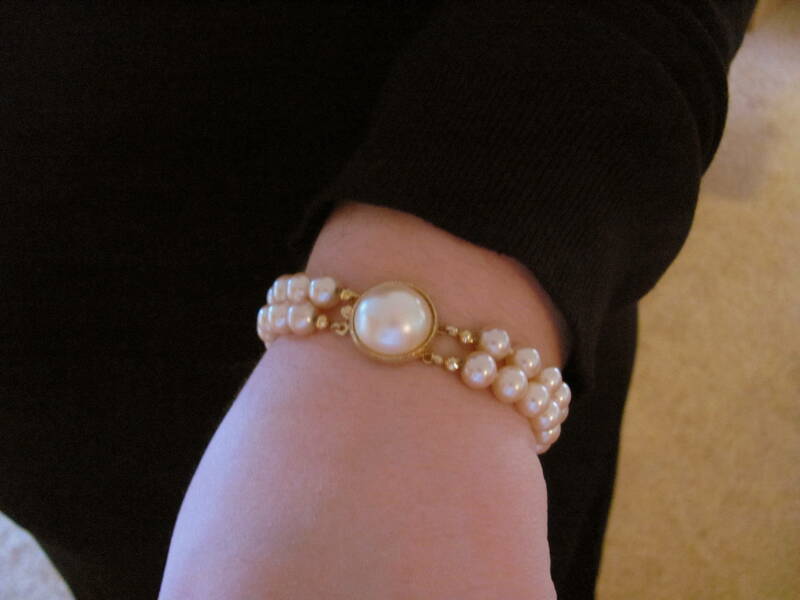 I love my mom’s pearl bracelet. She’s had this bracelet for a looooong time, but I have no idea the origin. The next quick look was inspired by my wanting to use some long owned but unused accessories. I had initially bought this belt from Torrid to go with a summer dress, but got it so late that the summer weather had already gone. (Only the black version is left.) I love the woven detail on the belt and initially wanted to wear this with similarly colored oxfords, but once I saw it all together it was a definite no-go. I still need to figure out how I want to work in my oxfords to another outfit. 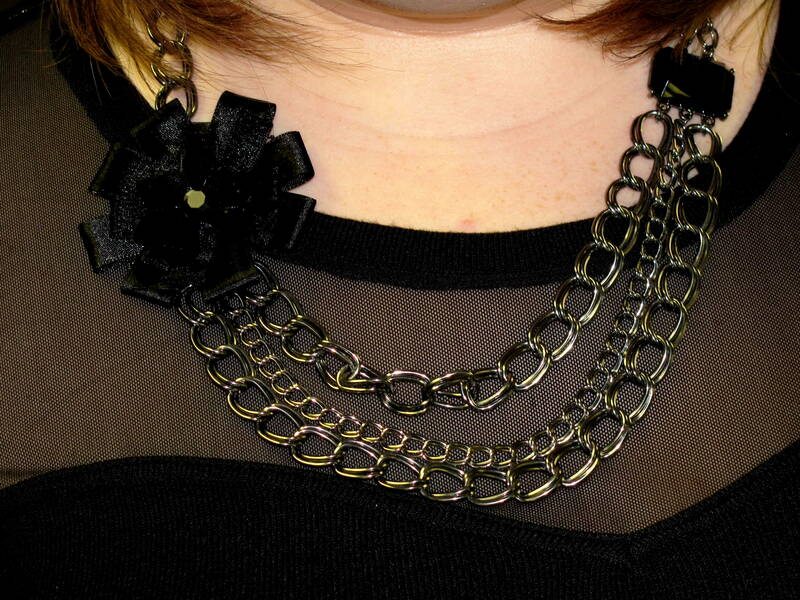 For the third look, I knew I wanted a necklace that had shine and was closer to the neck. 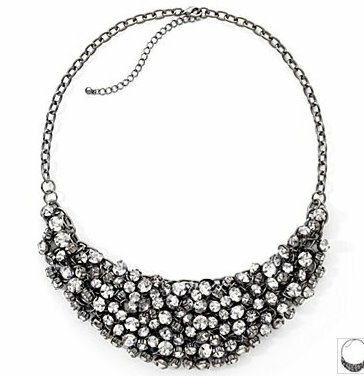 I really would have loved to wear a bib necklace, like this one from J.C. Penny, but since my jewelry collection is so limited, I had to hunt in my mother’s dresser. I ended up finding this chain necklace in my mom’s dresser. One end had a flower and the other had a plastic gem. It only turned out okay. In hindsight, the red lipstick was a bit.. well, red, and the clutch is a bit boring. I would really love to find some pieces that made this dress better for going out on the town at night. Overall, I really love this mesh dress. It could have possibly looked better had I worn spanx, but I really had no time or patience for that. The mesh itself is really nice. Sometimes it appears gray in these pictures, but it’s not as jarring in real life. I feel like there are tons of more ways I can play with this dress, including different shoes/tights options that I didn’t mess with this time. Which look did you like best? How would you wear this dress? I love the last look the best! The belt is great too but (and that’s just a personal opinion) I am not a big fan of camel and black together. In any case you look beautiful! adorable! love it with the brown belt. Great post! It’s always good when you can wear one dress many ways! I love all the ways you styled it, but I think the last look is my fave! I really love that dress, its fantastic! I love your 3 variations. And I agree, more accessories means more ways to wear similar items. Do stock up, but try for inexpensive versatile pieces. More bang for your buck!! *winks*. Great job!!! I love the first look! Also, I am so jealous that you have this dress! I’m going to try and catch it when it goes on sale, haha. I think you’ve done great with the accessories. Especially the last one, very dinner date ready and maybe cocktail drinks afterward. And thank you for following me back on twitter. This is fantastic! You are making me reconsider ASOS as a shopping option but I must be strong. 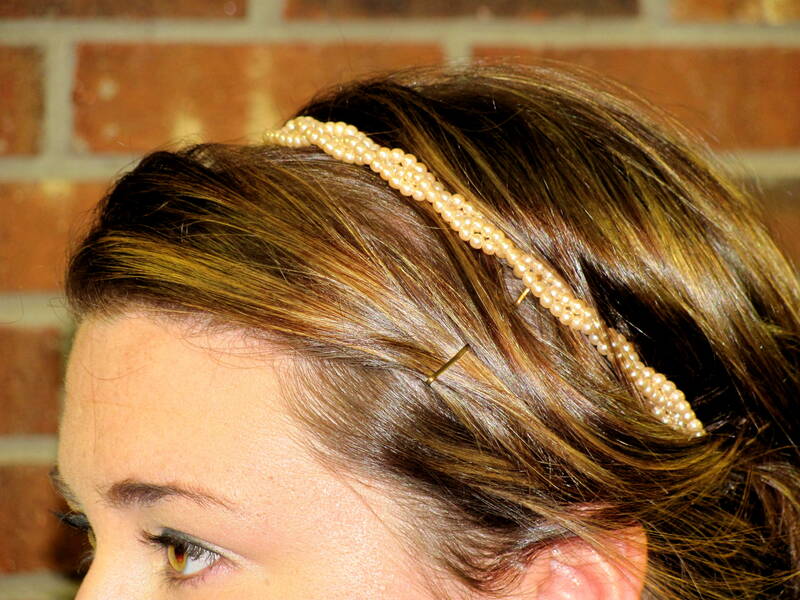 I really love the first look, the pearl headband is so cute! You’ve really made me notice that I need to do more with my hair, even when it is short. I either blow dry or air dry… yup, that’s it. I bought a similar shirt from Torrid awhile back but I love that it has mesh sleeves too. Actually, come to think of it – don’t think those made it to the blog… Oops! I love this dress! I really liked it in the powder blue..if only I wasn’t on a no spend 6 months! *sigh*. You look amazing. @Anika — Anika, you’re so sweet 🙂 Thanks a bunch. @Val — Thanks! I think the last is my favorite, too. The dress looks good with a necklace that length. @Natalie — Thanks, Natalie :)! I love it, too – especially the sleeves in the winter! @QueenDiva — I definitely will be! And some time off from buying clothes will be good since I need to learn how to remix them more. @Elizabeth — Thanks, Elizabeth :). It was definitely a splurge, but well worth it! @Nicole- Yea, ASOS is definitely a hit or miss. This dress is nice because the material is stretchy. I get in hair ruts all of the time with my short hair. If you notice, most of my posts before are just down and straight. I’m now trying to grow it out, so I can do more with it, but there are still fun things to do with short hair :). @ChatterMonkey — The blue version is so beautiful, but I knew I’d wear the black more often. You’ll appreciate the no spend in 6 months when you’ve saved money 🙂 Thanks so much! @Danielle — Thanks, girl :). The dress is still on the site when I look at it. If you click the “mesh insert knitted dress” link on my post, it should take you straight to the ASOS product page. Whoooaaa. I’m ridic. with the smileys! You look great! I love the last look! Totally classy and beautiful. *kiss kiss* I’ve loved the dress since it came online but i’m hoping to hold out till it goes on sale! The first look is my favourite! Now I am totally in love with the vintage playsuit 😦 ASOS is evil! Omg! We wore the same dress (well almost! Mine was short sleeved haha) on the same day! I think you might be my fashion twin :D.
You look so great! I love that dress on you! @MzDivaPlus — Thanks so much! @TheMerryTraveller — ASOS is evil for our wallets, haha. But they know how to have sales for sure :). Hopefully they’ll both go on clearance, because you could certainly rock them! @LaCara — Ha, awesome! I always wanted a fashion twin :-p. I saw you in the dress in your latest post. You look great! I’ll have to use you as inspiration and try this dress with boots next :). OMG you are the CUTEST dollface! Hi! Im candice and im from the Philippines. Could u help me find the perfect coctail dress for me, maybe u have something that i can follow the design. We are the same size. Thanks!